Around about the time of the terrible tsunami in the Indian Ocean, I wrote an article for The Luminous Landscape called "The K-1000 of Digital SLRs," referencing Pentax's near-deathless distilled-to-its-essence intro SLR that so many people learned to shoot with in numberless photography classes over the years. The occasion for that article was Pentax's *ist DS, which I'd just bought at the time. If you haven't read that article, the first few paragraphs especially—about the kind of camera company Pentax has traditionally been—may be worth checking out. 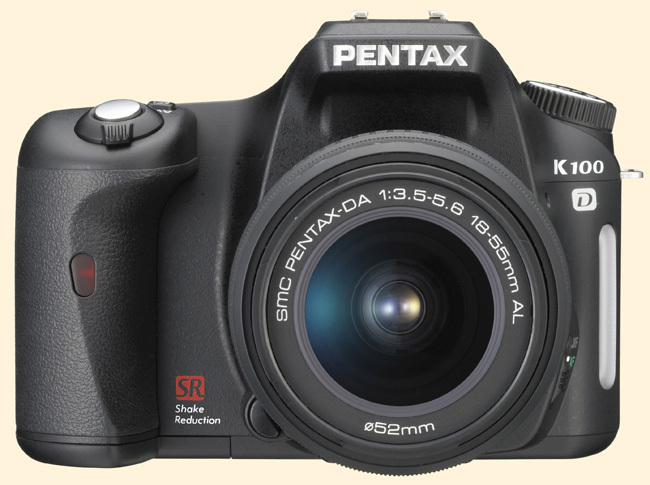 But the phrase might be even better applied to Pentax's newest, a sub-20-oz. DSLR available with (the K100D) and without (the K110D) built-into-the-body Shake Reduction. Not to sound like the proverbial broken record, but in-the-body vibration control has become a must-have feature for me personally, as it suits my chosen style of working so well. Two other facts bear pointing out with regard to Pentax's latest: first, that the other Pentax DSLRs have the best viewfinders of all the introductory DSLRs; and second, that despite Nikon getting most of the credit for this, Pentax actually has the best back-compatibility of any of the cameramakers, period, when it comes to lenses. You'll be able to put 6x7 lenses and 1950s screwmount lenses on the K-100D; you can use K lenses, M lenses, A lenses; the modern autofocus Limiteds fit, as well as all the FA lenses; and Pentax has so far released more APS-C primes than any other manufacturer, not to mention the inevitable selection of zooms. I had a 1970s vintage 28mm ƒ/3.5 K lens on the *istDS, and it was easy, and a pleasure, to use. Here's the press release for the new camera, which I'm sure interested parties will be able to read all about in the days and weeks to come on all the gearhead sites. It's nice to see one of my sentimental favorites continue to develop. The body based stabilization is a nice surprise that encourages me to think that it is a feature with a future across many platforms. "...a nice surprise that encourages me to think that it is a feature with a future across many platforms." Couldn't have said it better. I do get the same feeling myself. Liking the feature as I do, I think this is good news. "I had a 1960s vintage 28mm ƒ/3.5 K"
I used to own an MX and a Program Plus (and a K1000, and Super Program at various times) with prime lenses from 24 mm to 200 mm, including my favourite 100/f2.8, and an $80 400 mm screw-mount. About 4 years ago, because we were sick and tired of carrying two of everything on vacation, I migrated to Canon EOS to be compatible with my wife's gear. I sold all my Pentax stuff for about $1200, which was about what I had paid for it all over the previous 3-4 years, when I had become interested in photography again. My wife now uses a point & shoot digicam almost exclusively. Had I kept those Pentax lenses, I would now own reasonably-sized film and digital Pentax bodies and would have kept a bit of money in my bank account. I made a mistake. I made a mistake. I made a mistake. Good for them. My wife has a Nikon D70. I can't stand it. In contrast, I have pulled out my Dad's old Pentax MX and have had some fun with it and some of their fine (and small, and light) prime lenses lately. It is what a 35mm camera ought to be. This new K100 with anti-shake might even get me into digital! Of the remaining manufacturers, I have really been hoping that Pentax would survive the shake out. It looks like this will be a big help to them. I traded one of my redundant EOS lenses for a Pentax ist DS a while back. I then proceded to pick up a few Pentax "M" series primes on Ebay. Think I spent $200.00 for four or five lenses. What a fun outfit! Image quality gives up nothing compared to my 20D save for a bit of resolution loss. Go Pentax! 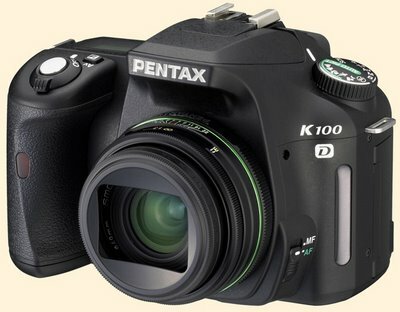 The K100D and K110D don’t have the same viewfinder as the *ist line—it’s a pentamirror rather than a pentaprism. It might still be very nice—I haven’t seen any actual reviews—but since it is a different design I don’t see how Pentax’s other viewfinder design is relevant. I also have to say that while it shouldn’t matter one whit, the “K100D” moniker is so much better than “*ist”. A compact DSLR! How wonderful. If the link does not show well, find it at eolake.blogspot.com, april 23. Including a picture comparing the size of my Pentax ME Super and my Nikon D200! @doug: The K100D VF specs are pretty much the same as those for the *ist DL (0.85x, pentamirror, NBMII focussing screen). So it's quite a relevant reference, actually. The DL VF is itself better than those of the competition (though of course the DS and D pentaprisms are better still). ... I like the look and the finish of the camera and the new lenses. I agree that the name is a significant improvement. Pentax have finally started reading the forums and probably noticed the large number of people wishing the K branding came back. Hopefully the K100D has that special 'quality' (for want of a better word) that made the K1000, and I hope for pentax's sake that it sells by the containerload. I now have a KM 7D, which I love, but the idea of having a tiny DSLR with antishake and ISO3200 with 3 pancake primes in my pocket really REALLY appeals. So much so, that if the price is right, I will sell all my KM gear and switch to Pentax + Primes in a heartbeat. I'm thrilled by this, particularly the stabilization. Time to start saving! What's the reason for elation over mere announcement of a 6MP cropped sensor DSLR in this day and age when you already have a reasonably compact full frame DSLR such as Canon 5D on the market that offers more than twice the resolution? If money is an issue, the 350D seems like a better bet. First, I love compact SLRs such as my ME Super. Though I shoot and enjoy Canon seeing this new Pentax at a reasonable price is making me even more excited, since I'd LOVE to have IS/VR/AS/SR with my 85mm/1.9 42mm lens which would ostensibly be easier to focus than on my Rebel XT. That feature is more useful to me than 10, 12 or 16 MP. And, I'd have no trouble owning BOTH systems. Horses for courses as they say. its nice to think that it won't be a 2 horse race anymore. it was kinda depressing to think that the only decent offerings were only going to be from either nikon or canon. hey pentax: why don't you really blow our minds and put a microprism collar around a nice 45 degree split-image on the focusing screen. make the focusing screen usable for focusing! its a crazy idea, i know. when was the last time a non-pro camera came with a usable focusing screen? and frankly isn't anyone who wants focus tracking and fps going to get a canon or nikon anyways.....do away with autofocus altogether! cut the weight and price...make this a true k1000 for the digital age. Having looked through both the *istDL and the Maxxum/Dynax 5D, IMO the former didn't look to be a patch on the latter. After hearing all the good stuff about the *istDS VF I had high expectations. It was still better than a 350D/DRebXT, but suffice it to say between the VF and AS, I didn't buy the Pentax. Partly nostalgia for some of these old photo-dogs. Personally for me it's the prospect of getting a cheap body that I can mount Limited's on with Anti-Shake and some kind of reasonable finder. My personal doubts above notwithstanding, I truly hope that they managed to improve the viewfinder a bit compared to the *istDL regardless of what the specs say. hey pentax: why don't you really blow our minds and put a microprism collar around a nice 45 degree split-image on the focusing screen. make the focusing screen usable for focusing! its a crazy idea, i know. when was the last time a non-pro camera came with a usable focusing screen? Frankly I don't know why all the manufacturers do this, I mean what's the point in not doing it? It's not like they have MF products to protect (not even Nikon, now that they've discontinued the FM3A). All they're doing is fostering a secondary market (KatzEye, Haoda, etc.) It's not as though they need to do any R&D for this thing. Plus they know the metering algo's inside-and-out, they just need to put a custom function in that says: "MF Focusing Screen-Y/N" and all the metering issues people have with these 3rd party products go out the window. "...do away with autofocus altogether!" That battle's been fought and lost. @anon1: 6mp is more than enough for the market this camera is aimed at, as well as for many serious photographers. If you need more pixels, Pentax has a 10mp body coming up. But you sound so, uh, trollish? @anon2: Pentax doesn't make such a screen, but KatzEye does, and so does a Chinese hobbyist (from a machined Minolta screen) for a much lower price on eBay. They can be fitted on the D and the DS, and supposedly work pretty well. The DL (and presumably the K100/110) isn't designed for changing screens, but some technician might be able to do the swap for you. I expect the 10mp body will allow changing screens. @peter: Agreed, I had only looked at the C/N competition. Shouldn't have made such a sweeping statement. The DS VF is markedly better than that of the DL, btw. I forgot to ask Mike, was it the stabilization feature that made you jump from a Pentax DSLR to K/M or something else? You had high praise for the *istDS and not long after you were the owner of a 7D. What caused the switch? Pentax might not be the perfect choice for action or wildlife or whatever - but anybody who appreciates a DSLR with a decent viewfinder and excellent ergonomics that will fit in a coat pocket with a good wideangle prime, has no other choice. However, apart from the shake reduction, the specs of these new bodies seems to mee to be somewhere between current DL and DS. I wouldnt trade in my DS for one of them. But hopefully they will help Pentax keeping a grip in the consumer DSLR market - meaning more advanced, but still compact bodies for the future (such as the announced K10D) and - most importantly - an increasing number of K-mount optics. "...was it the stabilization feature that made you jump from a Pentax DSLR to K/M...? I suppose people want to know if now that one can use Pentax glass and the limited lenses that are due to come out with an antishake body, will you be changing back to Pentax, or will you be sticking with Konica Minolta/Sony, and hope for the Sony lenses to be of excellent quality? Heres me hoping for a carl zeiss lens that has the same range and quality as the Sony R1 lens. With the 7D antishake, I don't think such a lens would ever come off my camera. i bought the km5d, the day BEFORE km pulled out of the pix biz. i returned the 5d to b&h the following day. i'm a longtime pentax fan: mx->zm->pz-1p ( i luved the camera body, so responsive and ai think program shift is a GREAT option. i was willing to move to a km base simply becuse of the image stabilization built into the 5d body. i returned the camera because i didn't want to pay top $ of an orphaned lens line. if...and i do mean if, the pentax image stabilization/anti-shake system is effective, and by the reviews of the pentax anti-shake system in their recent p/s entries which have been poorly received, i would rush to purchase the k100d. that said, i'll do so AFTER i see the reviews. having said all of the above, i'm smiling w/the idea of holding the pentax in my hands. Been wanting to get into the digital SLR game for a long time. I'm a former pro with a collection of Pentax lenses for my K1000. I've specifically been waiting for Image Stabilization in a Pentax body before making the leap to digial. Had the camera (K100D) for 2 months now and may never pick up a film camera again! Instant feedback for the scenes I'm shooting is AWESOME! For the price I'm getting a couple more for my daughters... These things are great!